Pickles are a thing of beauty. I can't eat a sandwich or a burger without one (or two). Dill are my favorite and the crisper the better in my opinion. I bought some pickling cucumbers at the farmers' market recently and proceeded to scour around for the best refrigerator pickle recipe I could find. Initially I was going to ferment them, but our place is just too hot right now to try to ferment. So I found this recipe that I used as a guide (though I completely modified the seasonings). I must warm you that they are completely addictive if you are a pickle fan like me! I've been averaging four a day... They are the perfect compliment to your favorite sandwich or summer burger! Note that these are refrigerator pickles so they are not preserved and are not safe for canning. 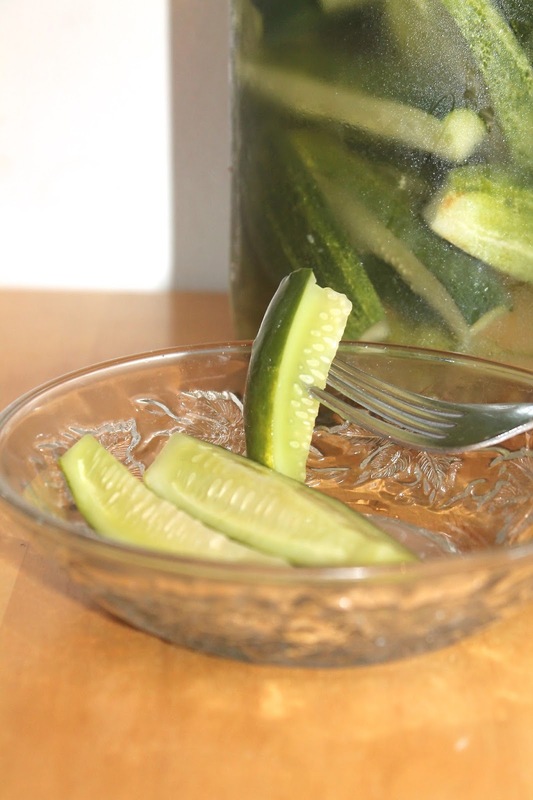 These pickles are ready to eat after about 48 hours of brining, and they don't last forever. You should eat them within a couple of weeks. If the pickles start to get soft/mushy or you notice any sort of mold, you've taken too long to eat them and they should be tossed. I put my pickles in one large half gallon jar with a Ball reusable storage lid. You can also use quart jars (3-4). Put the water, vinegar, and salt into a small saucepan over medium heat. Heat the mixture stirring occasionally until the salt is dissolved. Set aside to cool. Place the garlic, dill seed, dill weed, red pepper flakes, and black peppercorns into the bottom of a clean 1/2 gallon glass jar (you can use small jars, just divide the seasonings equally into each jar and add a garlic clove to each). Scrub the cucumbers well to remove all dirt. Trim the very ends off of each cucumber and cut into spears. Pack them into the jar - you want to fit as many as possible, but leave room to let the brine get into and around each spear. If you can't fit them all, that's OK. When the mixture is cool, pour it into the jar. 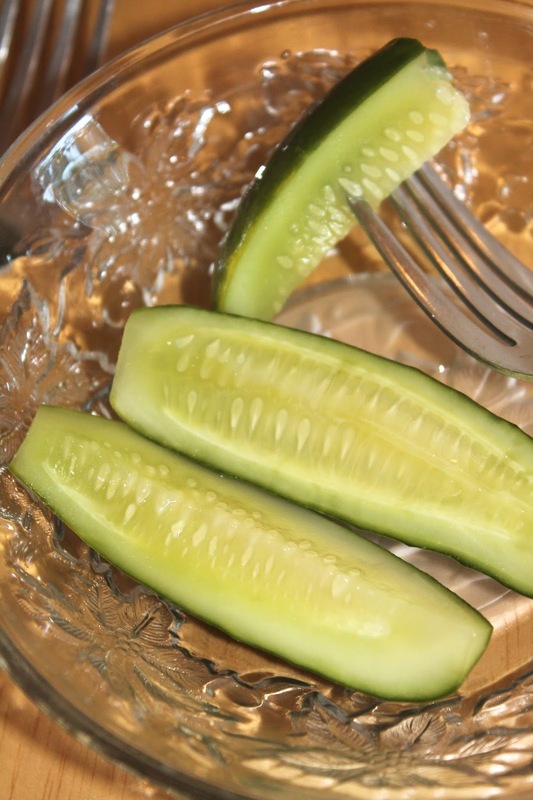 All the cucumbers should be covered with brine. Top the jar with a lid. Place in the refrigerator and they will be ready to eat in about 48 hours. 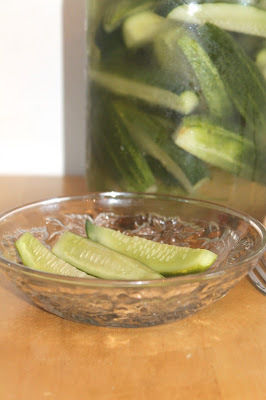 I love dill pickles and these are so so so easy to make! I too love dill pickles. These look so fresh and crunchy, Amy. I saw your picture of this recipe on Facebook and was hooked. They look delicious. Absolutely on my gotta-try list! Cool thanks! I hope you try them and like them! truthfully i'm not a big pickle lover. i'll eat them at a restaurant if they're on my plate, but i don't seek them out. these look amazing though! Refrigerator pickles are one of my favorite things to make with summer cucumbers! We are obsessed with pickles! Hi Amy, oh your pickles look perfect, I usually make a batch every year. Love the herbs and spices you used. Love pickles! And I love refrigerator ones -- pretty easy to make. These look terrific, and I love the seasonings. Really good stuff -- thanks. It's been ages since I've made pickles, but I've never made dill pickles. Yours look so crispy, just like I like them. I've go to give these a try! Thanks! I looovveee refrigerator pickles! So much easier than canning and just as delicious! I had a friend who just made pickles and I JUST decided to put it on my list to try. Saving this for when I finally get around to it!! I love me some pickles. I'm always ready for something new to do with the pickle crop. They sounds delicious! Yum!! Pickles are my fav! PINNED! Whoo hoo for homemade pickles!!! I'm pickling like a crazy woman right now - I have kerby cucumbers in the hundreds! Trying this tomorrow!! !